Smithfield, NC (April 25, 2016) -- The Johnston County Visitors Bureau (JCVB) will be participating in several events as part of the 33rd Annual National Travel and Tourism Week (May 1-7), which unites communities each year to celebrate what travel means to American jobs, economic growth and personal well-being. 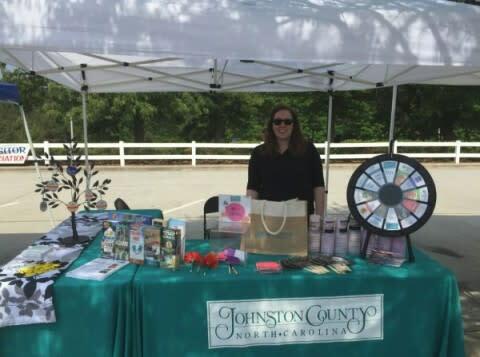 Each year the JCVB sales teams travels to the NC Welcome Centers at I-95 North and South to interact with visitors showcasing local Johnston County products, hotels, dining and attractions. Talking with visitors as they try locally grown strawberries from Smith&apos;s Nursery and Strawberry Farm, or learning about the opening of GALOT Motorsports Park near Benson, the JCVB sales team and industry partners will see more than 700 travelers at the welcome centers on May 5 and 6. Always a treat for visitors is meeting Ray Wheeler from Atkinson&apos;s Mill and finding out what a "hush puppy" is and children love the reptiles brought by Clemmons Educational State Forest in Clayton. It&apos;s a fun day for everyone attending as we showcase all our destinations have to offer. The travel and tourism industry directly employs more than 1,700 people in Johnston County. Total payroll generated by the tourism industry in Johnston County was $32.24 million. State tax revenue generated in Johnston County totaled $11.63 through state sales and excise taxes, and taxes on personal and corporate income. Approximately $5.33 million in local taxes were generated from sales and property tax revenue from travel-generated and travel-supported businesses. Spending on leisure travel generated $99.6 billion in tax revenue. Nearly 4 out of 5 domestic trips taken are for leisure purposes (79%). Top leisure travel activities for U.S. domestic travelers: (1) visiting relatives; (2) shopping; (3) visiting friends; (4) fine dining; and (5) beaches. Photo caption: Sarah Campbell, Sports and Leisure Sales Manager, travels with tourism partners to I-95 Welcome Centers to promote places to stay, things to do, places to shop and local dining options for travelers.